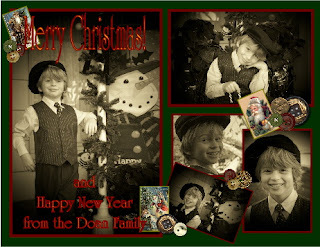 Dennis Doan Family: It's Christmas Time! Every year I think I'm going to slow down for this Christmas but it seems to just snowball ( no pun intended) with more and more activities, starting off on the first weekend of Dec. I finally got my tree up this weekend but haven't found the tub of ornaments yet, maybe this very last weekend before Christmas I finally will. Someday I will get organized, I say that every new year, as my resolution but I never stick with it. Logan is going haywire, I'll have to sign off for now. What cute pictures you have of Logan! I love the digital card you made, too! What program do you use? Is it photoshop? Anyway, I sure enjoy all this blogging....it is such a fun way to keep in touch! Love you guys! Merry Christmas! What a great idea. Logan is so cute. I love the scrapbook page - thank you for including it with your Christams card - what a great idea. Logan is so handsome! Merry Christmas! Logan is the cutest! I will have to try out that scrapbook program! Your pages are so cute! I know what you mean about getting organized...its a never ending chore! We hope your family has a Merry Christmas!! So what's happening lately Alicia? We miss you guys!